Plant These Fragant Beauties NOW! The plants should be fertilized in early spring and again directly after flowering with an all-purpose Rose or Flowering Plant fertilizer, watered in well. Note: even as tough as lilacs are, they will still need supplemental water during periods of drought. 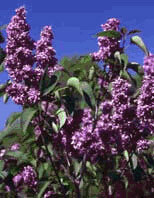 Lilacs can fall victim to leaf diseases in spring and early fall. These include powdery mildew fungus (Microsphaera alni) and leafroll necrosis. Powdery mildew produces unsightly whitish patches on the leaves, but the problem tends to be more aesthetic than physiological. Leafroll necrosis seems to be caused by air pollution.